The Facebook Side Hustle Course Will Re-Open Early Spring! Hey everyone! 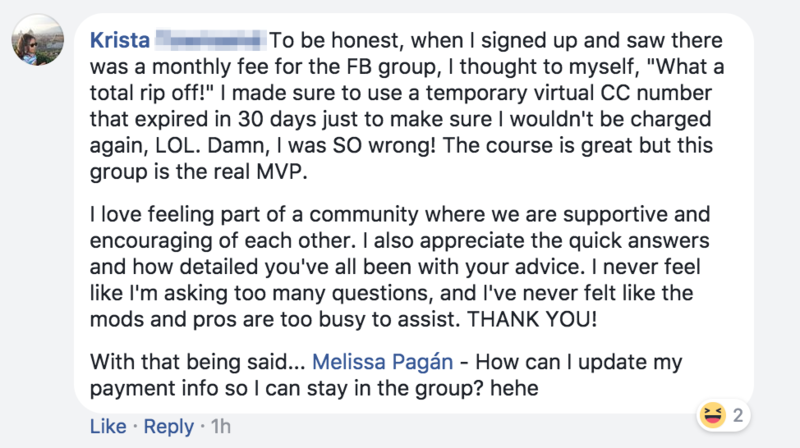 A ton of you have been asking about the FB$H course, so I wanted to give a brief update on the upcoming re-launch and how everyone has been doing that jumped in on the first session. Quite honestly, it's going even better than I thought it would. I knew we would have students that were going to go out and have success pretty quickly, but we are seeing people get multiple Facebook ad clients and absolutely crushing it. The course has only been live for two weeks! It's just so cool. I think my favorite thing has been seeing people with zero sales experience going out there and pitching Facebook ad services to clients like pros. One of the best things that Mike Yanda (the course co-creator) and I did was to include multiple client acquisition strategies for students. So if you aren't sure if you have what it takes to go out and get clients – don't worry. We've got strategies that work for introverted people (like me) as well as people who are super outgoing. We took a few weeks to get the first wave of students set up and rolling and were also able to get any kinks worked out with the course/add content as needed. Now that everything is running like a well-oiled machine, we are getting ready to re-open enrollment in a few weeks. I don't have an exact date yet, but right now it looks like we are in the mid-March/early April timeframe. Enter your email to get notified when the F$H Course re-launches this Spring! The course is obviously great, but what really makes it all work is the private group attached to it. A lot of courses have awesome content, but no support on the back end. Expert advice so that you can have all of your questions answered about ad campaigns, dealing with clients, etc. I have several private groups that I run, and they are all very good. But I've got to say, the FB$H group is by far the most fun of them all. Students are able to share their success stories, have their questions answered by Facebook ad experts that we've hired (Ben and Tanya), and also get access to me and Mike. The fact that we already have students making $1k-$2k extra per month, and several more that are in trial periods with clients at different price points tells me that this is the best side hustle out there right now. The best part? It's scalable. We already have students that are looking to get five (or more) clients and turn this thing into a full-time gig. Mike and I are there every step of the way to help people that want to go that route. If you are just looking for one or two clients and want it to stay a part-time gig, we're there to help you do that as well. That's really the focus of this course, but some FB$H students are taking this thing and running with it. The idea here is simple: make extra money in your spare time to invest more or pay off more debt. It won't be too long before we have students sharing their paid-off student loan balances or sharing their investing wins in the private group. So make sure you are on the waiting list and be on the lookout for the upcoming re-launch of the Facebook Side Hustle Course! No we don’t have it capped – so you are definitely good! See you in a few weeks! Thanks. Can’t wait. Also is this skill learnable by anyone- is it technical with a lot to take on? If you can log into Facebook, you can learn this. We have a bunch of people that are doing well with clients that have never done this type of work before. Hey there, I am just looking for a little more info on how the course works. Do I have access to all the material anytime? Is is self-paced? Thanks! Hi there! Yes, you get lifetime access to the course material, and it is also self-paced. Hope that helps! Does the course cover how to go about setting up the business? Meaning, how to choose whether to form an LLC or some other form, how to best track revenue/expenses and then properly file taxes (including paying quarterly taxes if required)? No, the course does not cover those topics. My advice is always to consult with an attorney and an accountant on those subjects (which is exactly what I did when forming my LLC and creating a tax strategy). Yeah i did notice in the course outline that it doesn’t cover setting up a business. Do you briefly cover this at all in the course? Would we be able to start getting clients without a registered company or would we need to set that up first? We actually brought my accountant in to do a live training on taxes and business structure in our private coaching group! We record all of our live trainings, so you’ll have access to that particular one in the files section of the group after you join the course. The short answer is that you do not need to set up an LLC before getting clients, but there are some things you should think about from a tax perspective so you’ll definitely want to check out that live training. How much will the price be going up? Will the course be open for enrollment indefinitely or will it just be open for enrollment for a few days again, like last time? When is the course, what is the price, and what does it cover? We will go live in about two weeks (check your email for updates if you’re on the wait list). Somewhere in the $300’s. It teaches you everything you need to know for running Facebook ads for local businesses. Within a few weeks, we’ve had a bunch of students get paying clients – one student has four clients already and is closing in on 5! What is the success rate of the students that have completed the course? If you follow this exactly how it is laid out should we get clients? It’s a little too early to give you an exact percentage for the entire group, but we have several students that already have paying clients, and two have broken the $4,000 mark in the first month. We give you everything you need to get clients, but it’s up to you to implement what we teach in the course and take advantage of the group support. When will the 2019 Facebook Side Hustle Course start? Hey Jennifer! We are launching on January 17 for four days. Make sure you’re on my email list and keep an eye out for the opening email! Aww man! I missed the January ’19 launch! When will there be another?! I’m pumped about this!